With assorted emotions, I just put Utami into a taxicab for her pre-dawn drive to Suvarnabhumi Airport and her flight back to Denpasar, Bali, Indonesia. Are these the feelings a "father" has when he says "Goodbye" to his "daughter" as she heads back out into the world and he doesn’t know when or if he will ever see her again? I met Utami five years ago in Kuta, Bali. She was "happy to accompany" me on my trip to Java. Two years ago we traveled together in Sumatra. This year, for her twenty-eighth birthday, Utami decided to make her first "overseas" trip. Despite her parents’ concern about the political situation here in Bangkok, Utami was determined to visit Thailand. Utami was "so excited" to be here and she made the most of her short time. The very first day she took a taxi to The Grand Palace and Wat Po and then took the ferry across the Chaophraya River to Wat Arun. Along the way she met Anna, a Ukrainian flight attendant and apparently they bonded. Anna counseled Utami to just be quiet and pretend she was a Thai national to save on admission fees. They had dinner together on Khao San Road. Naturally and inexorably, Utami failed to call me regarding her late schedule. From sundown until 7:00 pm until 8:00 pm, are these the horrible thoughts a father has (traffic accident, political violence, kidnapping, hospitals, police) as he paces the streets waiting for the return of his 152cm (5 ft), 41k (90 lb) slip of a daughter who can’t speak a word of the local language? At last, she stepped out of a taxi, smiling, and "so excited." I never let her out of my sight. We rode the Skytrain (elevated subway) to Mahboonkrong, the multiplex, multi-tiered, multi-multi-multi shop MBK shopping mall. Can I imagine the thoughts and reactions of a young woman from the rural district Tegalsari in East Java, where the only public transportation is horse and carriage, who went to the University of Technology in Yogyakarta (Central Java), and Udayana University in Bali and who visited Jakarta only a few times, who now works in a travel agency near the beach in Bali? Can I imagine her thoughts as she rides the sleek, efficient Skytrain as it snakes its way through a canyon of skyscrapers and deposits us at an eight story mall with two thousand shops and services, department stores, budget stalls, restaurants and movie theaters – more than one hundred thousand visitors every day who ride a dizzy web of escalators that criss-cross the open spaces of an enormous, neon-sign-plastered atrium?! I’m "so excited." I’m so exhausted! I needed a coffee. Utami ordered a waffle with whipped cream, maple syrup and passion fruit sauce. Kine-ahora! This girl can eat! Philippe, a tall, handsome kid from Quebec chatted up Utami at one of the Buddhist temples. Utami was pleased to meet him but she was concentrating on taking pictures. Besides, as a proper Muslim girl, Utami was uninterested in Philippe’s patois. 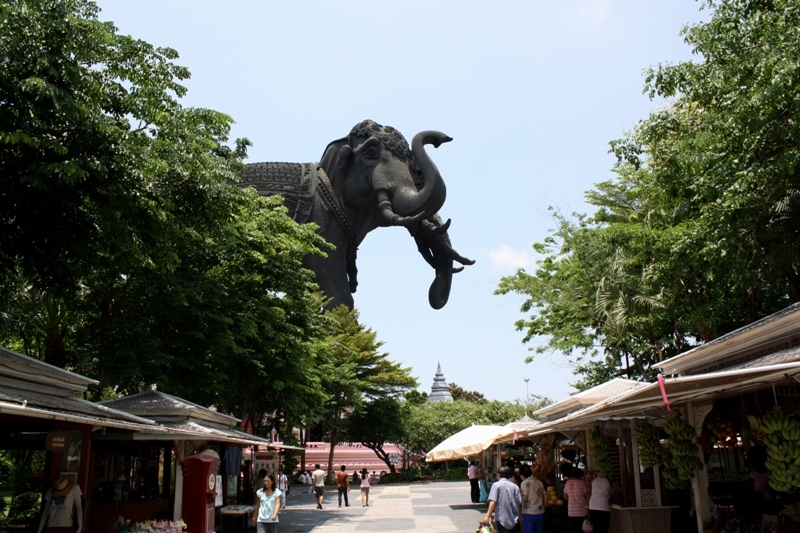 I invited my friend Noi to join us as we all went to visit the Erawan shrine – the giant three-headed elephant just outside Bangkok. I wandered the gardens and fountains as Noi and Utami visited the museum that begins inside one of the elephant’s legs and continues up into the stomach where there is an eerie, dimly lit-temple. Ancient Siam is well off the tourist track but well worth the visit. It’s like "Cliff Notes" for Thailand. Smaller versions of the major temples around Thailand are spread across the extensive grounds. Almost all of the visitors are cheerful, energetic Thai family groups. We hop on and off the roving vans. Some ride bicycles. Some drive golf carts. Everyone smiles at me. Lunch was at a miniature model of a floating market. Noi and I ordered "som tam" – the traditional Thai green papaya spicy salad. We encouraged Utami to try it and after a taste or two she said, "It’s nice!" Still hungry, Utami selected a plate of fried rice and chicken curry. Mamma mia! This girl can eat! The highlight of Ancient Siam is the replica of Prasat Phra Wihan, a hillside, hilltop ancient temple complex that actually sits across the border in Cambodia. We climb the temple stairs, take our creative photos and enjoy the cool breezes and the temple-top scenery below. "Indian food!" proclaimed Utami when we were discussing her final dinner in Bangkok. We all walked over to Soi 3/1. This area caters mostly to visitors from The Middle East. The walking streets are jammed. Am I in Cairo? Delhi? The host at the restaurant greeted me in English-Thai-Hindi-Arabic. He was pleased to see me again. Pans of tempting Middle East and India style food are arrayed in front of the restaurant. Utami was "excited." We selected curry chicken, roast lamb, roast vegetable and potato dishes, rice, garlic nan and mango lassi. We tried, and tried again but the food would not disappear. Thanks to yours truly, Utami and Noi learned a new English expression, "Your eyes are bigger than your stomach." After dinner, we strolled along the souvenir stalls on Sukhumvit Road. Utami stocked up on tee shirts, elephant purses, refrigerator magnets and assorted gifts for her family and friends. Noi bought Utami a candle holder with three scented candles – her gift to her new friend. I predict that later this year, Noi’s first overseas trip will be to Bali. Utami was a charming, genial guest. She has a positive attitude along with a resolute disposition. Unlike most of her Indonesian classmates who follow the traditional route of marriage, family and children, Utami has decided on an independent lifestyle. Her goal is to see the world. Little by little. She is a young woman without pre-conceived notions. Without judgment. Without prejudice. She always has a smile. Can we "fathers" learn from our "daughters"?